Note: This was first published on No Unsacred Place around 2011-ish, which went defunct a few years ago (RIP–it was a good site). Then it was on Paths Through the Forests, but I split from Patheos a couple of years ago due to philosophical differences with their new ownership. As they have not honored my request to have my writing taken down, and I don’t want to direct more traffic to them, I am slowly reproducing my work from there here. That way if I want to share this post with someone it will come from my site and not theirs. Please help me by sharing this link around–thank you! The beauty of the wild is the long gesture of life in time. The beauty of skin and fur and feathers, the beauty of blood, the beauty of bones sinking into grass. That is the quote I painted on a recent creation of mine, shown in the picture above. My canvas was a piece of rawhide left over from a drum kit. 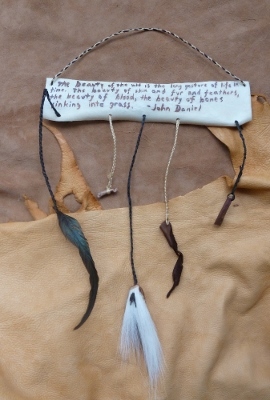 The visual punctuation of the entire piece included an eclectic mix: a rooster feather; a coyote toe bone; a sea urchin spine; and two pieces of deer hide, fur and leather. I chose the quote deliberately for that piece. There is a certain ambiguity to the words, flowing from one end of the life-death cycle to the other. “Life in time” breathes and pounds its heart, while the “bones sinking into grass” create a vivid image of the core structure of the animal, all the rest borne away, disintegrating into nourishment for the flora. In between, the hides and the blood are left open; they may be alive and running yet, but the blood may also be sluiced upon the ground, and the skin stripped from muscle and tendon and prepared for preservation. In much of the United States, people have a poor relationship with death, to include that of nonhuman animals. The idea of the “poor, dead animals” (particularly those that aren’t carved up on a dinner plate) is often enough of a shock that no one wants to think, let alone talk, about it. We eat beef and pork, not cow and pig, and very few of us ever eat anything that’s looking back at us; even the shrimp are conveniently decapitated for our culinary comfort. The most common discourse about dead animals seems to come from some animal rights activists who quite often use guilt, shame, and shock to try to convince unsuspecting leather-clad omnivores into changing their ways. When the choices are either silence or stigma, there doesn’t seem to be much room in between for more moderate discussions. I choose what I perceive as one potential moderate path, tempered with much awareness. 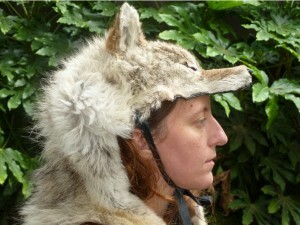 For over a decade I have been an artist of animal remains, part aesthetics and part spiritual work. On the one hand, I very much appreciate the lovely curve of bone and the lush texture of deerskin, the intricately veined colors of feathers, and the varied structures of the hairs of all sorts of furs. Beyond animal parts as an artistic medium, though, the core of my work is funereal. From the beginning my art has been about reclaiming these remains from being trophies or status symbols, and a significant portion of my “supplies” is made of old fur and leather coats, reclaimed taxidermy, and the like. 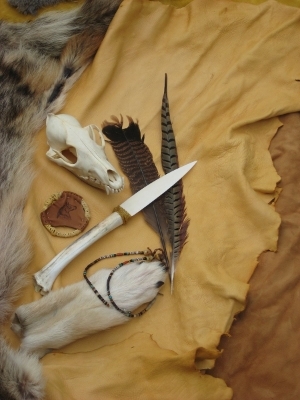 (1) I guide these remains to a better “afterlife” with others, as has always been my role with them, and everything I make with animal parts gets a full ritual purification as part of my pagan practice. Over the years I’ve gotten a wide variety of reactions to my work, from awe to indifference to outright hostility. Thankfully the responses have canted toward the more receptive, whether in person or online. I get the distinct feeling, though, that most people, regardless of their views, are highlighting certain individual facets of the work that, together, I tend to take as a whole.Most of the people who favor my work seem to primarily connect with it on an aesthetic level. They like having something pretty, whether as something to wear, or as a “powerful” ritual tool. They appreciate it as art, which is perfectly fine. At the other end of the spectrum are the occasional activists who come in swinging; they see the death and the remains, to the exclusion of anything else. On some occasions, though, I will meet people who bring my art home both as art, and as sacred remains. They haven’t glossed over the fact that what they hold was once living, often combining the parts of animals that never would have met in life (such as the cow and the sea urchin in my wall hanging above). But they still see the beauty in those remains, and in the fact of their death. They can appreciate the loveliness of a long-dead deer’s ribcage seated in a field, and the arrangement of those same ribs into a totemic shrine. They know they carry lives in their hands. I have not lost sight of the living end of the cycle, either. I have always donated a portion of the funds I make from selling my art to nonprofit groups that work to preserve both animals and their habitat, as well as informal donations to friends and acquaintances in need of help with emergency vet bills and the like. I think my partner, S., put it best when he told me that my most powerful alchemy was taking the remains of animals that had often died cruel and inhumane deaths, and turning them into funds to help those creatures still living and the environs that support them. And I do my best to educate people about the sources of the remains; I maintain a database of international, federal and state laws on possessing and selling animals parts in the US to help them make educated decisions. Nor do I lie about those of my “materials” that are byproducts of the fur industry; I do not claim they’re roadkilled or “natural deaths”, or wild instead of farmed, to try to assuage people’s guilt or to make me look more ethical in their eyes. To do so would be an insult both to the people I speak with, and the animals themselves, never mind my artistic and spiritual work. This work with the remains is another foundational part of my nature-based path, and as I write in this place over time, you may see me refer to the “skin spirits” as a collective term for the spirits of all the animals whose remains I work with, skin, bone and otherwise. My nature-based paganism is rooted in all of the life-death cycle, and this is how I seek the beauty in that which is all too often ignored, or so symbolized as to be almost entirely removed from the gritty reality. (1) I have become so known for collecting dead critters in certain circles, in fact, that I have been over time gifted with a number of antiques that were inherited by people who had no idea what to do with them, and so decided I was a good next stop for Grandma’s fur coat, or Uncle Doug’s deer heads. Did you enjoy this blog post? Consider picking up a copy of my book Skin Spirits: The Spiritual and Magical Use of Animal Parts, or The Tarot of Bones, or my other books (some of which also have dead things in them!) Or you can check out my artwork made with hides, bones and other natural and found items. And I have a forthcoming book about Vulture Culture, the subculture that has formed in recent years around the appreciation of taxidermy and other dead things.